Doua'dat is a young adult yautja female. Standing at seven feet in height she does not have much more to grow, but her body type is still slightly leaner than that of a mature female yautja. Her skin is a darker yellow with brown, red, and orange markings, and she has a few small, short whiskers framing her face. While she wears her "dreds" long, a chunk of them in the back are shorter than the others, the result of a sparring session. 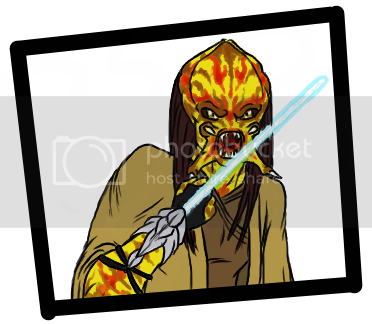 She typically wears a plain, unadorned mask while in citadel-standard atmospheres, and lacks the usual elaborate weaponry and armor of Yautja- instead wearing Jedi robes with lightweight armor beneath them. If you feel like it, you can put stuff like special talents or pros and cons down here.